Have you ever tasted or heard about Vietnamese coffee? It has unique flavor that will impress the most discerning drinker. Our coffee products are not so well-known like those of Brazil, Mexico, etc., not yet at least. We still lack of strong brand names like Starbuck, Nescafe, etc. to bring our national caffeine-rich products to the world. Vietnam mostly grows coffee in the Central Highland regions, including Dak Lak, Gia Lai. Many varieties are grown there, including Arabica, Robusta, Excelsa (Chari), Liberica, Catimor, and others. Buon Me Thuot Coffee is actually a brand name that all Vietnamese know. Regretfully, due to belated registration of intellectual right protection, this trade name falls into a Chinese company who quickly registered in many countries. Recently, there also appear many national makers like Trung Nguyen, Highlands, Vinacafe, etc. 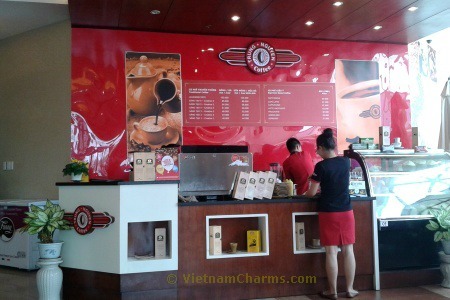 Their coffee grounds taste well to us Vietnamese, but not so popular to foreigners yet. When searching for factors making unique flavor of our coffee, I find an interesting list from trung-nguyen-online.com. I refine and add some more for your reference. What make Vietnamese coffee unique? beans are generally roasted in what is referred to as "butter oil"
You can easily find coffee shops in a big city like Hanoi, Da Nang, and Ho Chi Minh City. They may be big and luxury shops with dedicated space for guests. Besides coffee, other beverages like lemonade, orange juice, mixed juices, and snacks are also served. Other coffee shops may only have simple and small rooms. Usually, the owners use up their own houses for their business space. Many other shops even don’t have specific room at all. Drinkers just sit on a small plastic chair on pavements. The advantages are simplicity, convenience, and cheap price. You can get a cup of iced coffee for only fifty US cents. Since 18th century, French brought coffee species into Vietnam. My country’s topography creates perfect microclimates for coffee growing. When I was in high school, I learn many history lessons about the plantation of coffee and rubber. There, native farmers were forced to work so hard, even to death under the exploitation policy of the French colonists. Nowadays, my country becomes the second largest coffee exporter in the world, only after Brazil. In 2012, we exported about 1.5 million tons worldwide. It is my favorite drink, especially in heated up days. The iced coffee has very special flavor and taste that make drinkers awake and ready for a new day. Read more about Vietnamese iced coffee. Vietnamese coffee makers provide us with very convenient instant coffee with 3 in 1 recipe. Usually I only use soluble coffee (ca phe tan) like G7, Vinacafe in office. Personally, whenever having enough time, I prefer café phin or Vietnamese iced coffee. Usually I don’t do it myself, but go to coffee shops. It’s great to have some friends or partners, sitting, talking, and waiting for coffee drops dripping slowly through filter. Then, after a while, sipping traditional Vietnamese iced coffee. It’s a peaceful and satisfying feeling. It’s a piece of cake if you’re living in Vietnam. If not, you can buy at Vietnamese grocery stores in your place. Otherwise, you can buy it online, e.g. Amazon.com. All in all, Vietnamese coffee has unique history as well as flavor. With methodical brewing and preparation, consumers easily have a cup of Vietnamese iced coffee. I hope you like our made-in-Vietnam coffee as well as reading this article. If you do, would you mind giving me a Like? Thank you!